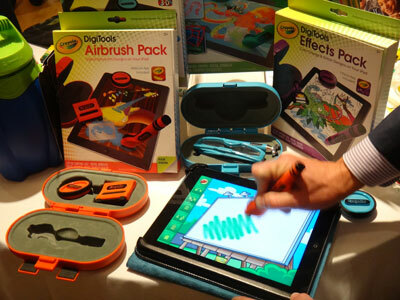 If you have a child who loves to spend time on your iPad, and also loves to color and draw, then you’ll want to check out the new Crayola DigiTools. With clever special effects, kids can create eye-popping pieces of art using Crayola’s four new app packs. Each of the four packs has a distinct set of effects including glitter designs, digital spray art and "magical color changes.” There’s even a 3-D pack with a set of glasses so kids can see their masterpieces come alive off the screen, and stencils for the digital spray art. Along with the app, each DigiTools pack has a clip-on carrying case, pages of virtual background scenes and animated stamp designs. The apps come with virtual crayons, markers and colored pencils in Crayola colors that kids are already familiar with. Once your child’s masterpiece has been completed and saved, your creations won’t be stuck on your iPad. Crayola allows you to email these works of art to friends and family, or even upload them to Facebook. If you think it’s fridge-worthy, you can print their work directly from your iPad to any AirPrint-enabled printer. So this may be your child’s perfect virtual palette to spark cool creative and eye-popping digital art. Four packs will be available for sale, including a 3-D, Effects, and Airbrush. Each pack retails for $19.99 on amazon.com and the Deluxe Pack, which incorporates all three of the effects, costs $39.99 on amazon.com .